Just in case you were unclear on the subject, a post on the Motorola Forum from the forum manager, makes it clear that the unlocked Motorola Moto X Pure Edition is not a developer edition. This means that unlocking the bootloader, which might be tolerated on a developer edition handset, will void your warranty on the phone. However, Motorola is saying that the warranty could still be considered in place if the bootloader is unlocked and the damage is an unrelated physical malfunction, such as a "bad volume rocker," or a "failed speaker." As long as there is no sign of physical abuse on the phone, honoring the warranty on such unrelated physical issues will be considered. According to the forum manager, "The key is that the problem can't be traced to software or abuse." The same rules will apply to the MotoCare extended warranty. So if you are a modder, you still might be able to have coverage on some issues. 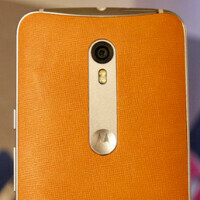 This apparently will be decided on a case-by-case basis at Motorola's discretion. Makes you wonder why didn't they release a developers edition. Do you ever wonder why every other phone on the market doesn't release a developer edition? Or do you save all your asinine comments for the Motorola related articles? Name one mainstream flagship phone that have developers edition. Go on I'm waiting for you to back up your bs. Problem is currently the only one I'm aware of is the Nexus line of devices. Good job, Rebel. Notice the lack of response. We call that foot-in-mouth disease. It's really not any different than any other product though. If I modify a product and it gets screwed up because of that, then that's on me, not the manufacturer. If someone unlocks the bootloader and screws up the device because of it, that's no different than if they'd dropped it and cracked the screen. That's not Motorola's fault, it's the user's. But it does say that defects unrelated to unlocking the bootloader will still be covered, so really they're fulfilling their obligation to the customer, covering their side of things. I know the 2013 had an official Developer Edition, and last year's Pure Edition was an unofficial DE, but I wonder if it was more of a headache for them than it was worth. I've never rooted or rommed any of my Android devices, I'm content with the customization available out of the box, so this is still my choice for my next phone. I agree, if you screw your phone up for tampering with the bootloader then you should be held responsible, not the manufacturer. I will give them the warranty part. I'm just curious as to why they didn't include a developer's edition of the phone this time around. I think they also had a DE for the Turbo on Verizon and another DE for the 2014 model I think. I usually don't unless it's for a useful feature like blocking ads. Nope, the only model for the Turbo that's at all different was the Best Buy variant in blue, but other than color the same phone. And like I said, the 2014 Pure Edition is considered by some to be a Developer Edition, it bypassed carriers and sent updates directly to the phone, like the XPE is going to do. I must have gotten it mixed up with something else. I could have sworn there was a developer's edition of the Turbo around. doesn't matter in the least to me. It's still so much of a value. Only in U.S do they need to clarify this and make maybe not canceling your warranty if you root into a selling point, because in Europe there's a law saying they can't cancel the warranty for rooting unless they can prove it lead to physical damage. America has something similar. Called the Magnusson-Moss Act. Doesn't explicitly refer to phones and rooting, but it boils down to manufacturers responsibility to prove that the consumers actions led to the issue in order to deny warranty claims. Must the bootloader be unlocked to root it? To TWRP it? Sorry if the questions are naive but that's just me. Why give customers the ability to unlock BOOTLOADER and not the tool need to fix device and return back to stock when issues arise??? Especially when I have an unlocked no contract Moto X PURE Edition.